Welcome to the Math Salamanders Prime Numbers List page. Check out to see if you have found a prime number using our Prime Number Tester, find the factors of a number and print out some of our pre-prepared prime number lists here. Use our prime number calculator to see whether a number is prime or not. This calculator will also tell you what the factors of your number are. It will also give your number as a product of prime factors. A prime number is a number that is only divisible by itself and 1. It must also be greater than one. Another way of saying this is that the only factors of a prime number are 1 and the number itself. 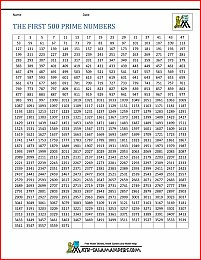 We have several pre-prepared prime numbers lists for you to print. What is the ...th prime number? 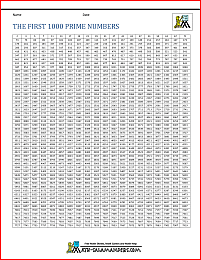 These chart tell you the first 100, 200, 500 or 1000 prime numbers all on one printable page. Our Prime Number Charts page is similar to the prime number lists on this page but contains charts giving all the prime numbers up to a certain value. There is also a Prime Number Calculator which will calculate all the prime numbers within chosen values up to a million. 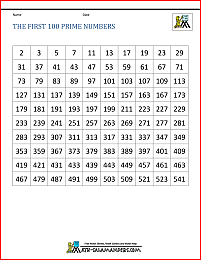 The Sieve of Erastosthenes is a method for finding what is a prime numbers between 2 and any given number. Eratosthenes was a Greek mathematician (as well as being a poet, an astronomer and musician) who lived from about 276BC to 194BC. 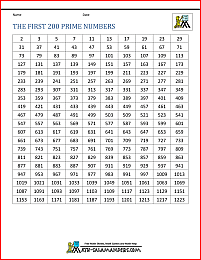 If you want to find out more about his sieve for finding primes, and print out some Sieve of Eratosthenes worksheets, use the link below. Want to find out more about primes? Take a look at our Prime Number page which clearly describes what a prime numbers is and what they are not. There are also many different questions about prime numbers answered, as well as information about the density of primes.